Lorraine Morgan of National University of Ireland Galway will give a talk for the Open Source Specialist Group (OSSG) at the BCS Central London Offices, First Floor, The Davidson Building, 5 Southampton Street, London WC2E 7HA (http://www.bcs.org/upload/pdf/london-office-guide.pdf)) on Thursday 2nd December 2010, from 1800 to 2100. Open source software (OSS) is seen as one of the most well-established examples of open innovation, resulting in changing views of the OSS phenomenon from a low cost artifact to a driver of strategic business value. In its emergent form, OSS represented a community-based software development model where geographically dispersed programmers collaborated to produce software. However, OSS has since transitioned into the realm of mainstream business and plays an important role in the business models for firms in high technology and other industries. Nonetheless, as an open innovation phenomenon, OSS raises concerns in commercial settings due to worries about the quality and suitability of external ideas, perceived competitive necessities, the challenges associated with exploiting global networks not current known to the firm, and issues relating to organisational control. Consequently, the very concept of OSS as a form of open innovation requires all types of firms to rethink their strategy. In addition, the shift of focus from ownership to one of openness requires a reconsideration of the processes that facilitate value creation and value capture. Lorraineâ€™s research focuses on how firms create and capture value with OSS. Additionally, her research examines the role of value networks in facilitating both processes. This presentation highlights some conclusions from previous findings of case studies conducted in this regarding. Lorraine is also interested in conducting some focus group studies at this event to draw upon the audienceâ€™s attitudes, feelings and experiences of this topic. Bio: Lorraine is a lecturer in business information systems at NUI Galway, Ireland. 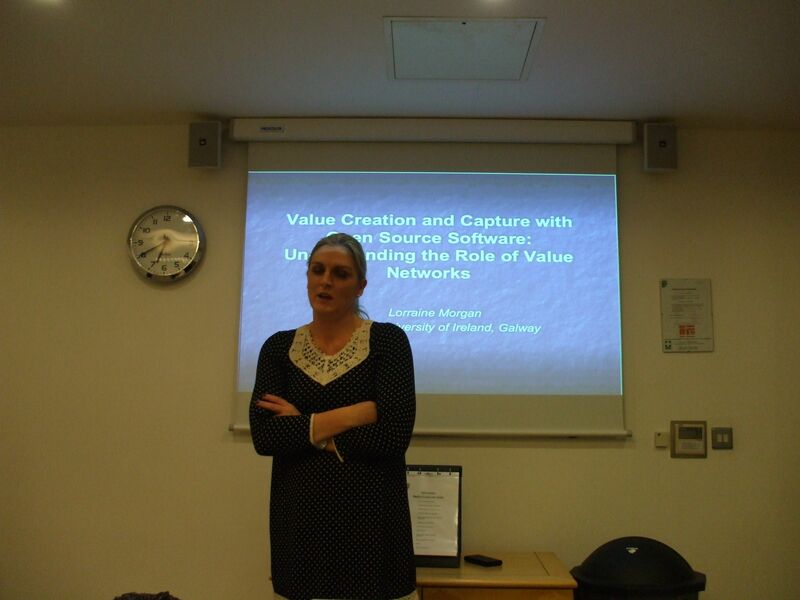 She is also pursuing a PhD with University College Cork on the role of value networks in firm value creation and capture with open source software. Lorraineâ€™s principal research interests are open innovation, open source software, open business models and value networks. Additionally, some of her research, one of which received a best paper award, has been published in journals and conferences such as Database for Advances in Information Systems, European Conference of Information Systems (ECIS), International Federation for Information Processing (IFIP) Working Group 8.6 and 8.2 and the International Open Systems Conference.